This was my second home birth in Stinson Beach in the past two years. 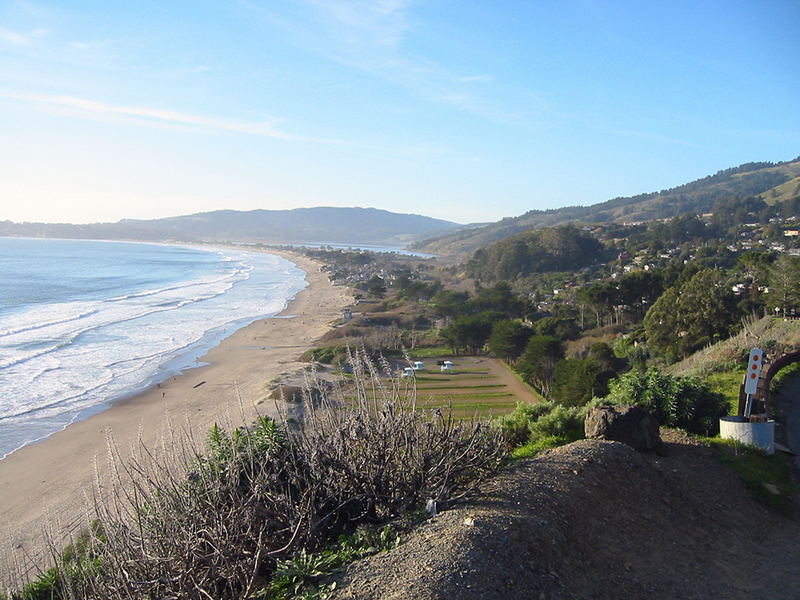 Stinson Beach is not that densely populated with childbearing women and few that choose home birth. So as a home midwife it is always a treat to have local clientele. All births are special. However, Sarah’s birth was particularly memorable, She had been born at home herself some thirty years ago, in the same Stinson Beach house she planned on birthing in. I got the call at 7 am from her mom, who reported that Sarah was in labor. She hadn’t slept much and got in the hot tub outside around 6:30am. Her contractions had gotten closer together and were sounding more intense. I asked her some standard questions I ask all clients in labor, regarding the frequency of contractions, when they started, and if her bag of waters had opened. I told her I’d be right over, 15-25 minutes coming from Bolinas after picking up my assistant. My car was already packed with all my midwifery equipment, so I hit the road and picked up my assistant. On the way over to Stinson my husband, whose native language is Spanish, got a call from Sarah’s father. He told him I had left for a birth. Sarah’s dad said ” I hope she left for our birth”. It was clearly one of those moments where there was a language gap. I also received a couple missed calls on my cell from their house, with reception being poor around the bends of Highway One, I knew there was no point in calling back since I’d be there soon. My assistant and I arrived shortly and were greeted by Sarah’s mom and dad. “She’s in her room”, her mom said. I went into her room and saw Sarah working hard breathing through the contractions- they were close together and long. “It’s definitely not early labor. I’m staying and getting all the birth equipment set up,” I tell her family. They seem relieved to hear this. I help breathe with her through a few contractions and my assistant comes in to rub her back as I listen to the baby’s heartbeat and check her blood pressure and temperature. Everything is perfect and her labor appears to be progressing nicely. I excuse myself from her room to set up the birth supplies, oxygen, newborn resuscitation equipment, suction devices, and anti- hemorrhage medications. I hear Sarah moaning in the bathroom now. It’s her first baby– I figure we have a few hours at least. I hear my assistant call my name ” she wants to push”! She’s sitting on the toilet and clearly she’s feeling the urge to bear down. I crunch down next to her and and listen the the baby’s heartbeat with my hand held Doppler. You can hear the healthy rhythm of her baby’s heart. I peak between her legs and sure enough I see a dime size of black hair. “All right,” I say, “your cervix is completely dilated and your baby’s coming down”. My assistant brings all the necessary equipment into the bathroom, It’s a small space, but we find a way to organize ourselves. We assemble the wooden birthing stool and have her sit on that instead of the toilet. We put the receiving blankets on a electric heating pad so they will be nice and toasty for baby when he comes out. With each push we see more and more head, I show her with a hand held mirror. He is almost crowing, I ask her to get off the birth stool and on her hands and knees to hopefully prevent any tear, I put warm compresses on her perineal tissues as they stretch the last bit, and then gently the his head emerges. It is always a awesome sight to see a little human half-way out this portal we call the birth canal. Then in less then minute his body slips out like a wet chunky fish. He is here alive and well, we hear his first cries almost instantly, wet and fresh telling us his story. I place him on mom’s chest as she reaches down for him. They soak in sweat, amniotic fluid, tears and blood. There is a sense of euphoria, love, relief that he made it earth side, he’s here after 9 months of waiting. Sara’s wide-eyed with joy. I sit quietly observing her baby’s respirations and his color tone. He looks amazing, he has transitioned to breathing with such grace and is so present with his mom. I check for signs that the placenta has detached . When it appears it has, she sits on the birth stool and it plops out. The placenta looks so vibrant, healthy, and full of life. I don’t try to get her up right away, she is cocooned with blankets and fed sips of bone broth. These are the moments that dreams and laundry rooms are made of. Since mom and baby are stable, my assistant and I give the new family some privacy. We sit in the dining room sipping freshly brewed coffee while filling out her chart. We relish in the honor we have to share these intimate moments with families.